Egan Bernal completes a Colombian fiesta on the Col de Turini and assumes the race lead. 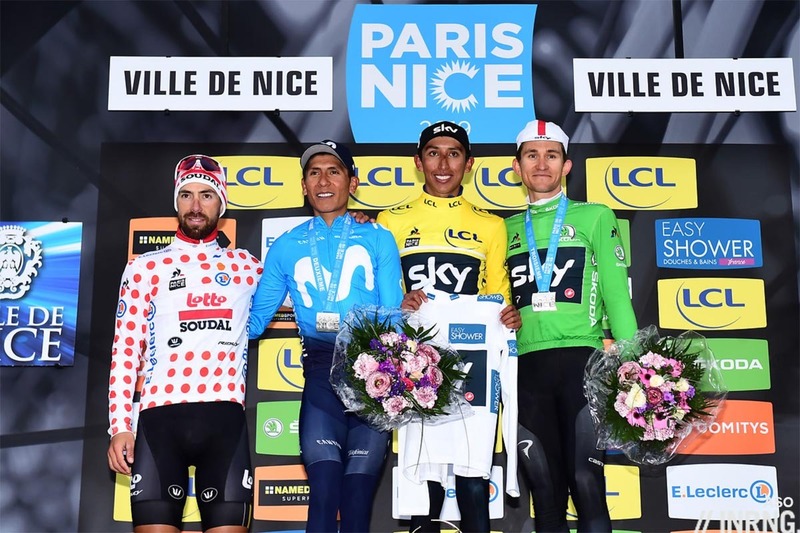 After battling crosswinds in central France, posting the sixth best time in the time trial, Bernal assumed the lead of Paris-Nice and if Quintana tried again the next day, the overall result never looked in doubt on the final stage. It was Paris-Nasty for the first two stages across central France thanks to a storm and weather warnings. 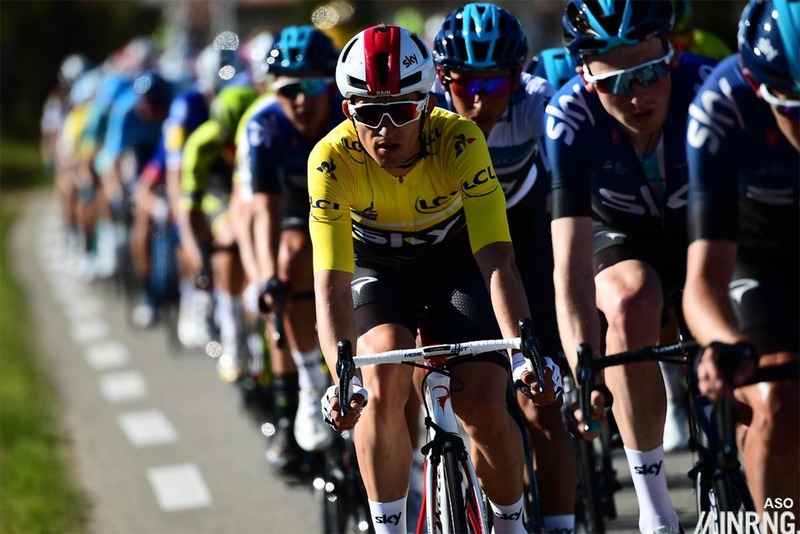 Dylan Groenewegen won a bunch sprint on a day when various contenders and pretenders saw their chances of winning overall vanish and Marc Soler, Ion Izagirre, Jack Haig, Fabio Aru among those losing time. Stage 2 averaged over 50km/h and after a relatively gentle start. 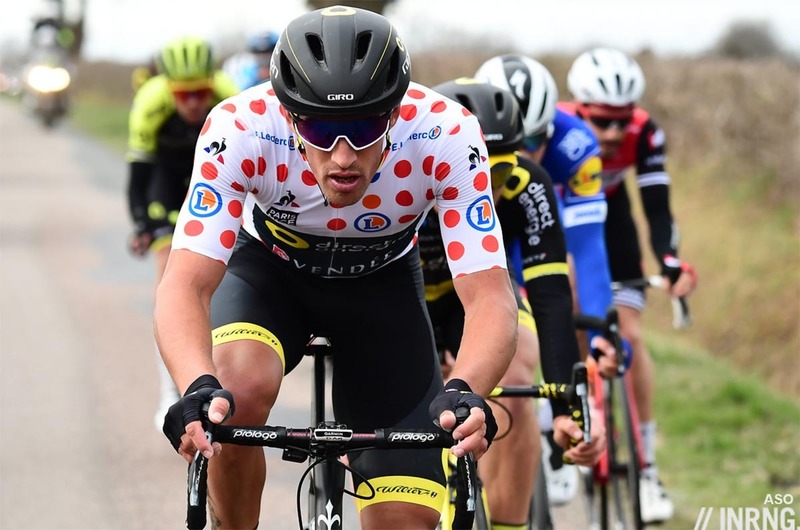 Groenewegen won again but only after he made the final split of seven riders and Egan Bernal impressed, seemingly at ease in the crosswinds as he was shepherded by two experts, making the kopgroep when some thoroughbred Flandriens did not. Sam Bennett won a pair of stages. He quit wearing the points jersey but only had a handful of points over Michał Kwiatkowski, perhaps he didn’t think he had a chance but more likely he just didn’t fancy the mountains ahead of Milan-Sanremo. He’s been a second wave sprinter able to win big from time to time but looks more dependable, especially in a week where Mark Cavendish and Marcel Kittel didn’t get a top-10 between them. Their status affords them time to turn things around but it’s unusual to see prolific winners struggling, although Cavendish is still probing whether he’s clear of mononucleosis, to race hard is to bring on the very fatigue that could see the virus take over. 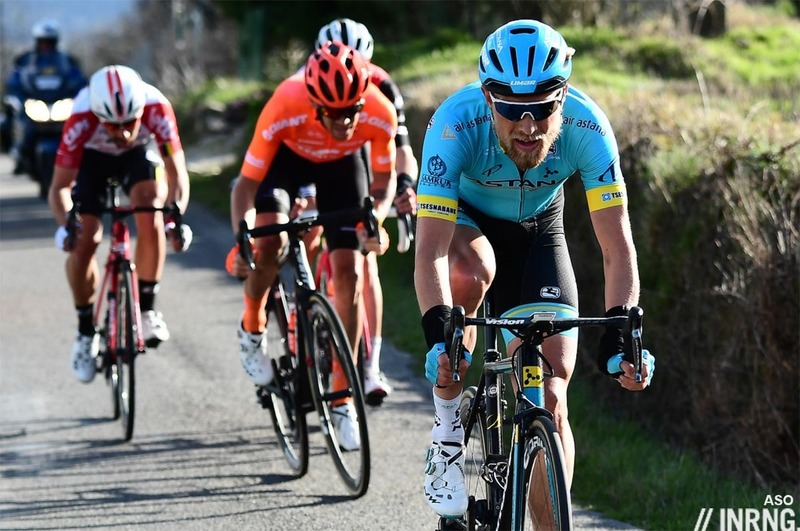 On Stage 4 to Pélussin and the breakaway stayed clear with Magnus Cort beating Thomas de Gendt, Alessandro de Marchi and Giulio Ciccone, although De Gendt took the mountains jersey and would keep it until Nice. Ciccone’s a Giro stage winner so not a new name but the 24 year old has had a good start with Trek-Segafredo. 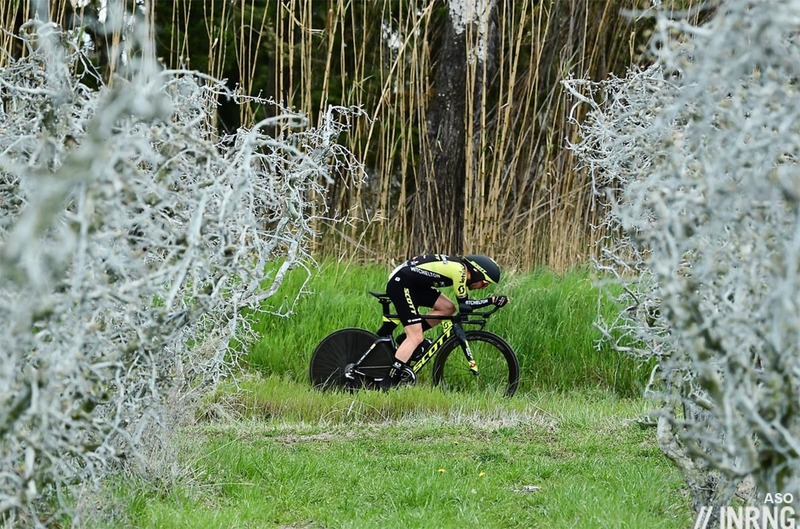 Simon Yates’ time trial win will worry rival Giro d’Italia contenders. You can sometimes win road stages with a dash of luck but not a time trial. Yes, the weather changed for the late starters, yes Yates sat out some of the crosswind battles but he chasing the breakaway the very day before the time trial. It’s still impossible to imagine Yates beating Tom Dumoulin in a time trial, but he looks able to limit the losses. Still it’s just one day and if this was a surprise so was seeing him finish fourth on the Turini, behind Cofidis Nicolas Edet. The Col de Turini proved too much for Kwiatkowski. The climb was scaled fast but with Philippe Gilbert still up the road Team Sky had to pick up the pace further in case Gilbert took the race lead with a margin and this meant Kwiatkowski’s yellow jersey was sacrificed, pas de cadeau. Up ahead Dani Martinez won the stage, a Colombian fiesta as he beat Miguel Angel Lopez and behind Nairo Quintana led Egan Bernal in. The final stage had its fireworks. 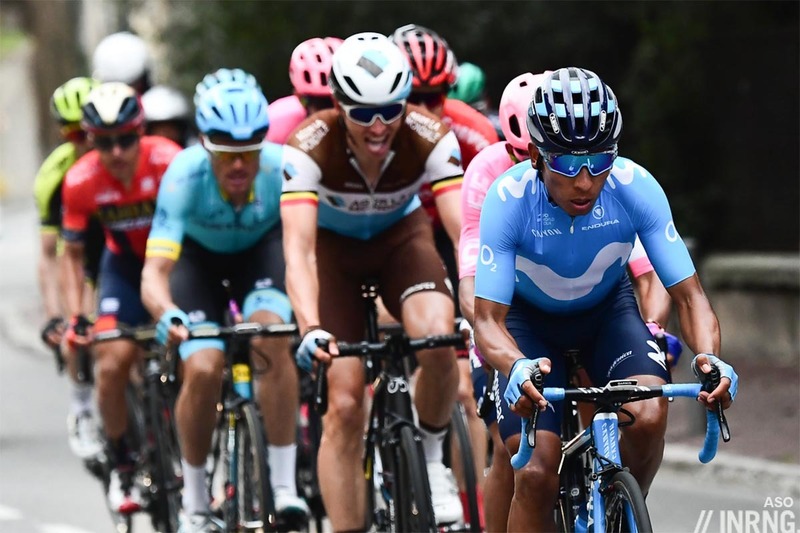 Nairo Quintana took off on the climb to St Pancrace and if he had three team mates up the road only Marc Soler could last more than a few minutes. It was an unequal contest, last year when Simon Yates was overtaken by Marc Soler he ran out of team mates with Matteo Trentin among those tasked with chasing, this time Bernal had Kwiatkowski, Ivan Sosa and Tao Geoghan-Hart for support and they kept Quintana within range, although it was good to see him try. Ion Izagirre took the final stage, he’d long had a tow in the day’s breakaway and surged up the Col d’Eze in the big ring. A great week’s racing, the final stage wasn’t the étape à la Hitchcock we’ve enjoyed in recent years but it was still enjoyable to see Nairo Quintana take off and try. The week as a whole was better than the last couple of years, the early stages enhanced by the crosswinds. Paris-Nice manages to combine cycling’s northern tradition with its southern, to blend crosswinds with cols and remain authentic. At 22 Bernal is a young winner of Paris-Nice, not the youngest. René Vietto was 21 when he won in 1935. Bernal is the youngest since Stephen Roche in 1981. Nevermind the history, Paris-Nice can say more about the future, a proving ground for young talent. Only last year Marc Soler started the final stage in the white jersey and then won the race outright and the race has long been a proving ground for young talent, the white jersey winner a protagonist or even the outright winner in recent years – Kwiatkowski himself won it before. Still, seeing Egan Bernal donning a yellow jersey at the top of a summit finish felt important, a scene likely to be repeated for years to come. Before he aims for the Giro, there’s seeing how he copes with pressure and he wasn’t tested much this week, Kwiatkowski shouldered much of this but we’re down to parsing the softer skills because he passed all the hard tests. An enjoyable race, a proper test of an all round bike racer. Inrng I’d like to know what would have happened with the neutral service wheel change for Kwiatkowski on stage 2 had he been riding disk breaks? Is it a case of just being slower or waiting for team car and missing the second group? If that were the case it would have been race changing. He was lucky to get back but perhaps it was more due to the race, weather in the moment, with discs it would be complicated but probably just slower. Most are going towards a standard system with the same rotor size so a spare from neutral service should work, it’s just the added time of swapping the wheels with thru-axel rather than a quick release. For now Team Sky have disc available but don’t use them much. And now the mechanics use battery-operated power drills to loosen and tighten the thru-axel so they are basically down to the same shifting-times as with rim-braking wheels. I have still to see how the neutral car deals with the 2 types of wheels. I believe they can service both but for a limited time; meaning, they can only carry so many wheels and having 2 types naturally halves the number of traditional wheels. Well, I was only thinking of rim-brake and disc brakes versions. You are of course right, on top of those, the different manufacturers also comes into the calculation. My first thoughts on seeing the wheel change were, he’s lucky to be on rim brakes. In situations such as echelons where a delay of a handful of seconds can mean the difference between remaining in the race or relegated to an also ran, it appears that choosing disks is very risky. Also as you’ve pointed out Inrng that Sky choose to continue to use rim brakes is very telling in terms of risk management. That is correct on the televised level of races and teams. But lower categories still have mostly wheels mounted on the cars. Egan Bernal was impressive, he coped with pretty much everything that came his way and was respectful towards Michal Kwiatkowski, always good to keep your team mates onside. A bigger challenge awaits around the roads of Italy in May. Yet again Movistar could not provide proper support for Nairo Quintana, there was no way he was going to be able to take on almost the whole of Team Sky on his own (I am sure I counted 6 Sky riders at the head of the peloton at the foot of the Cote du Paile). This has been a recurring theme for the past few years, it does suggest something not quite right in the team. 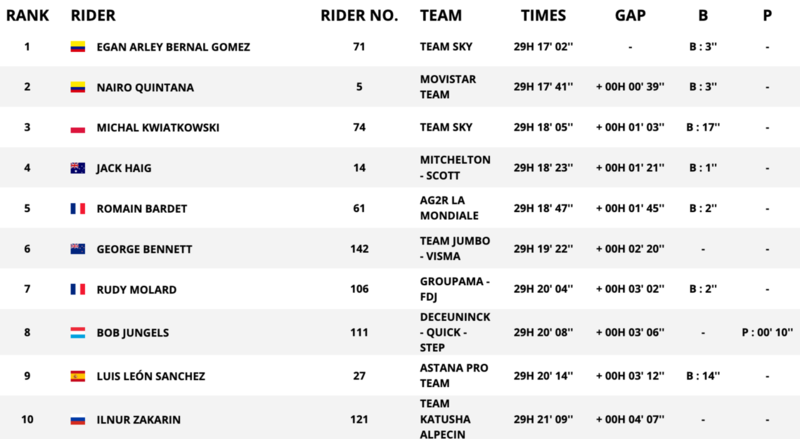 Perhaps also worth noting that Team Sky had more South Americans riding than Movistar did. 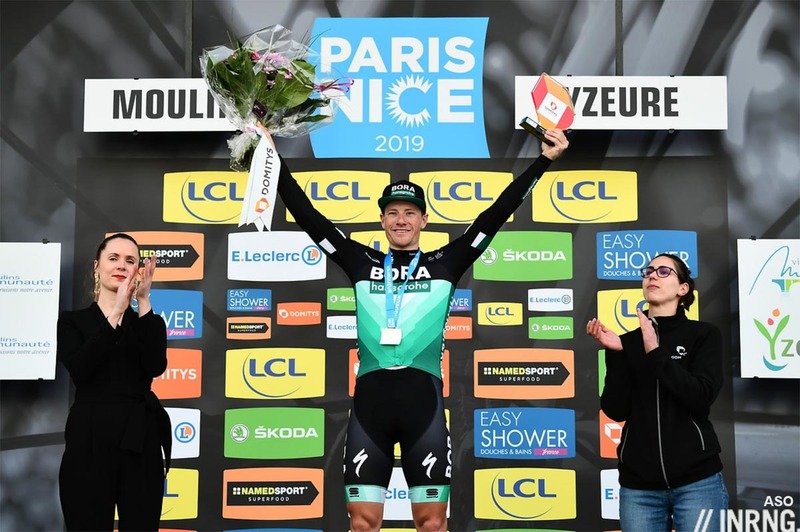 It does seem a shame Sam Bennett is unlikely to be at the Giro or Tour, he has really come on as a sprinter, perhaps time to move away from Bora Handsgroehe. As usual looking forward to another season of intelligent commentary on the best cycling site around. It would have been different for Quintana if the break had a bit more margin when they hit the climb, but he caught them too quickly meaning they couldn’t work much on the climb, that said Anacona wasn’t climbing like he should have then either. Bennett’s stock is rising and with Sagan’s form uncertain (or a grand bluff) is interesting for Sanremo. If anything the pressure is now on Ackermann, he’s got to win a stage in the Giro to prove it was worth leaving Bennett out although Bennett can still do the Vuelta etc. I’d have thought that the Bennett / Sagan mix is ideal for Bora at Milan – Sanremo? Bennett if it comes down to a straight up sprint with the out-and-out fast men, and Sagan for the Poggio move? If Gaviria, Ewen, Viviani et al are riding, I don’t think Sagan can afford to leave it late? That sounds good but what if Sagan goes on the Poggio and the move is caught, does Sagan commit to lead out Bennett or maybe after 250km Sagan is the stronger as it’s a different kind of sprint? Away from the road for team management there’d be a lot more media coverage of a Sagan win, his charisma reaches kitchen and bathroom showrooms that Bennett doesn’t, but they’re paid to make these decisions. You’re right, too many names to remember. Sky picked a team aimed at the final two stages, only Rowe and Kwiatkowski for the flat stages in central France. Great write up thank you. I know that sky are often accused of being boring- setting a tempo train on the front. But watching the last stage, I thought it takes a lot of guts to trust you’ll reel in those late attacks. Keeping calm in a wild stage is tough. Bernal could’ve freaked but didn’t. 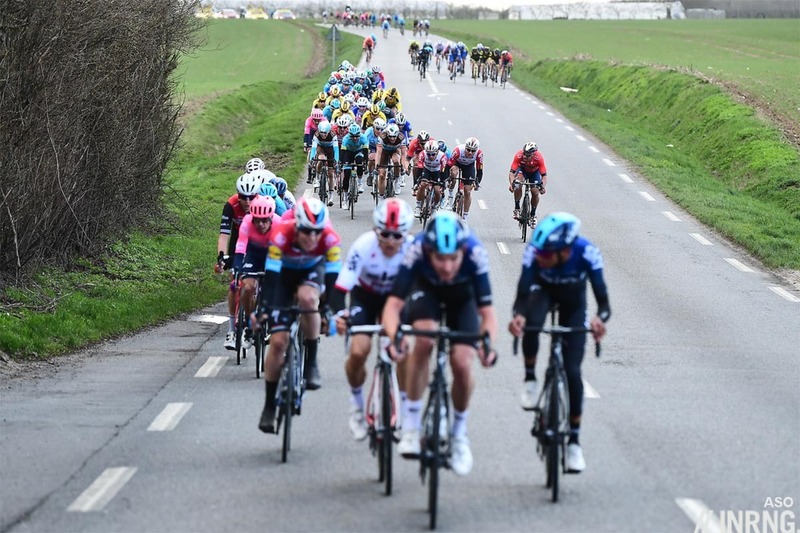 Cue the radios… They knew exactly what speed to ride as their DS was well aware of the time difference and the composition of the Quintana-group and Q’s loss of helpers. They knew – as did Quintana. So I’ll tip my hat to Q for sticking with his attempt almost to the line despite the Sky-train reeling him in ever so slowly but surely. Would have been interesting if they only had the blackboard-moto show up every now and then. Or if Quintana had copied Gilbert the previous day, and ridden in a separate group between the leaders and the peloton, so that there weren’t consistent time-gaps? But probably very difficult to deploy; he would have had to ride alone or with teammates and make himself “disappear”. His position in GC and the intentions of his attack would make that quite difficult. A moto would ride with him more or less at any time. I think the moment Bernal won was when Movistar couldn’t find allies to help Quintana and Soler. Maybe they didn’t offer checks, or people were afraid of Sky. But in many such situations, allies typically appear out of nowhere. It’s absolutely amazing how versatile and complete Bernal already is at 22. Nothing seems to faze him, and I’ve yet to spot a single weakness. Has to be seen as one of the top favourites for the Giro already; I’d put him at least on the same level as Dumoulin and Simon Yates. Loved the race in all its diversity. Only minor gripe: why can’t they make sure there’s an hour between the finishing times of the Tirreno and P-N? Both races had fantastic stages well worth paying full attention to, and it’s a shame fans have to choose between them.